Milledgeville may be well-known for our historic attractions and our lively downtown district, but another little-known fact is that Milledgeville is overflowing with art. From museums to outdoor murals, the streets of Milledgeville are alive with the vibrancy of creativity. We’ve compiled a list of the collection of visual and performance arts opportunities ready for you to enjoy here in Milly. Georgia&apos;s Old Governor&apos;s Mansion now serves as a historic house museum whose mission is to care for, collect, interpret and exhibit items (including artifacts, structures, and gardens) that illustrate the history of the site and its inhabitants during the years the Mansion was the official residence of Georgia’s governors (1839-1868). In 2015, the Mansion was named an affiliate of the Smithsonian Institution. Open for public tours Tuesday-Saturday, 10-4 and Sunday, 2-4 with tours every hour. Since its founding in 2004, the mission of Georgia&apos;s Old Capital Museum Society, Inc., is to identify, interpret, preserve, and communicate the historic, artistic and cultural heritage of Milledgeville, Baldwin County, and the Oconee River basin through its museums and educational programs. Tours of the legislative chambers are included on the Historic Trolley Tour. An architectural gem built by John Marlor in the "Milledgeville Federal" style with its characteristic columned double porch. The Brown-Stetson-Sanford House served the state capital as the Beecher-Brown Hotel and then the State&apos;s Rights Hotel for the many visiting legislators who came to the area. Don&apos;t miss the spiral staircase which is a Marlor trademark. Open by appointment and on the Historic Trolley Tour. The John Marlor Art Center is one of three historic buildings which make up the Allied Arts Center. This area was once known as "The Strip" which was the heart of the African-American district until the 1980&apos;s. It now houses arts offices and the Marlor Art Gallery. Allied Arts offers arts camps and workshops for all ages and hosts a gallery of visiting artists that changes bimonthly. Gallery Hours: Monday-Saturday, 8:00 a.m. - 4:00 p.m.
Andalusia served as the home of famed American author Flannery O’Connor from 1951-1964. Today, Andalusia serves as a museum whose mission is to care for, collect, interpret, and exhibit items that illustrate the history of the site during the time which Flannery O’Connor lived on the property. Hours of operation are Tuesday-Saturday from 10-4 and Sunday from 2-4, with all tours on the hour and the last tour beginning at 4PM. The Georgia College Natural History Museum is an academic and research treasure for students, faculty, staff and the public in the southeastern United States. The 2,500-square-foot museum is dedicated to earth sciences, emphasizing paleontology – the study of fossils and ancient life forms. The museum is free and open to the public Monday-Friday from 8 a.m. - 4 p.m. The Rose Hill Mansion is a significant example of the finest plantation architecture of the Milledgeville area as well as the entire cotton belt of the Old South. Rose Hill was listed in the National Register of Historic Places in April 2017 as an excellent and intact example of the Greek Revival style and the Georgian house type in Baldwin County. Open to the public Monday-Friday from 8:30-4:30 and from 10:00-4:00 on Saturday from March 1 to November 15. Explore the southern charm and beautiful scenic byways of the Antebellum Trail Bicycle Route, a 170-mile trek that winds through a collection of Georgia’s most beautiful antebellum towns. Take time to visit each community’s Welcome Center, town square, shops, restaurants and quaint settings and you’ll be guaranteed to get a big helping of the simpler pleasures in life. Milledgeville&apos;s Trolley Tour is the best way to take in the town. A drive through the landmark historic district includes rotating visits to the Old State Capitol, St. Stephen&apos;s Episcopal Church, Rose Hill and the Brown-Stetson-Sanford House. Tour stops vary daily. The trolley tour is available once daily, Monday-Friday at 10 AM and on Saturday at 11 AM. Built in 1911, this historic building was Milledgeville’s local grocery store until the 1980’s. Now Allen’s Market is a part of the John Marlor Arts Center, and is open for use as a theatre, studio and meeting space. Heritage Hall is the home of Georgia College&apos;s special collections, the Usery Leadership Gallery, and the Pat Peterson Museum Education Room branches off into distinct areas. Special Collections, Ina Dillard Russell Library, Georgia College, serves the middle Georgia region by: 1) documenting the history and culture of Milledgeville/Baldwin County and its contiguous counties and, 2) by ensuring that the lives and experiences of our diverse communities receive historical recognition and representation. Gwen Diehn is a professional artist and art teacher who has been working in the Asheville, NC, area for many years. Her work hangs in a number of collections including at the National Museum of Women in the Arts in Washington, DC. Gwen is happy to show the fruits of her labors – the 44 sketchbooks that hold the 10,000 drawings. Enjoy live music on the front campus of Georgia College from the University&apos;s own Jazz Band as well as other featured artists including Rodney Jordan. Bring a picnic basket and blanket and sit out under the stars while listening to the sounds of classical and contemporary music! Join friends of music and enjoy the sounds of JazzFest with director Cliff Towner. May 4, 2019, 3:00 p.m.
A six day movie explosion in the heart of Georgia&apos;s Lake Country. Features and shorts are welcome in a contest that mixes our city&apos;s history and new filmmakers with the Oliver Hardy Comedy Award and Central State Hospital horror screening. Compete, chat, and celebrate with other filmmakers. Whether you&apos;re a creator or avid moviegoer, we hope to see you in Milledgeville, where we&apos;re crazy about film. Join friends of music on the lawn of Georgia&apos;s Old Governor&apos;s Mansion for a fun, music filled night featuring the Georgia College music department. April 13, 2019, 6:00 p.m. This exhibition display contains Drawing, Mixed Media, Painting, Photography, Printmaking, and Sculpture from adult artists (age 18 and over) who practice a visual art form either full-time or part-time and who live in central Georgia. 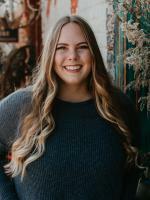 April 29, 2019, 1:00-3:00 p.m.
Avery is a senior at Georgia College pursing a degree in Mass Communication. In her free time, you can catch her re-reading her favorite books, sipping lattes at a local coffee shop, or planning her next weekend getaway. Above all, Avery wants to live a life full of purpose and passion and inspire others to do the same. You can now experience The Milledgeville Virtual Visitors Guide online! View and/or download the Guide now. Can't wait to receive our guide in the mail? Securely sign-up for our FREE e-newsletter!